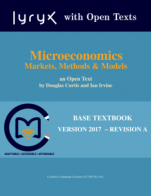 Microeconomics: Markets, Methods, and Models by D. Curtis and I. Irvine (edited by Lyryx Learning) provides concise yet complete coverage of introductory microeconomic theory, application and policy. The text begins with an explanation and development of the standard tools of analysis in the discipline and carries on to investigate the meaning of 'well-being' in the context of an efficient use of the economy's resources. An understanding of individual optimizing behaviour is developed, and this behaviour is in turn used to link household decisions on savings with firms' decisions on production, expansion and investment. The text then explores behaviour in a variety of different market structures. The role of the government is examined, and the key elements in the modern theory of international trade are developed. Opportunity cost, a global economy and behavioural responses to incentives are the dominant themes. Examples are domestic and international in their subject matter and are of the modern era. This text is intended for a one-semester course, and can be used in a two-semester sequence with the companion text, Macroeconomics: Theory, Markets, and Policy. The three introductory chapters and the International Trade chapter (Chapter 15) are common to both books. Microeconomics: Markets, Methods, and Models (Lyryx) by Douglas Curtis, Ian Irvine, Lyryx Learning Team is licensed under a Creative Commons Attribution-NonCommercial-ShareAlike 4.0 International License, except where otherwise noted. Yes. It covers wide range of microeconomics in an introductory level. In particular, it includes very-well summarized glossary section. Contents are accurate and I haven't found an error. Though there may be some typos in the text given its mass volume over 400 pages. One comment is about solutions to exercises - an option to provide solutions of either odd or even number of questions and leave other questions as practice. An instructor can use those questions with answers in the textbook as homework or similar type of class activities. I believe so. Except more recent economic data, content will be easy to be updated. This criteria is one of strengths of the textbook. It was easily written for either 1st year or the second year of students in Economics or relevant programs. It must be read easy and reader-friendly. Yes. Two authors did a nice job to make sure the text is written and be read consistently through the book as like one person writes all parts of the text. Each school has different schedules, like term system or semester. This modularity can be a challenge to use the book. It may have difficulty with dividing or reorganizing the chapters in some cases, particularly in a shorter period of the course. I suggest the authors include a few examples of the course outlines by different lengths of the course. Again, this is an strong point of the textbook. Yes, it was, at least to me. I couldn't find major errors. It touched at some points, especially in chapter 13. I understand this 'diversity and inclusion' would be hard point to obtain in an introductory Economics. More real-life examples and articles from the newspapers could add more diversity and concerns in the textbook. Or they can be provided as additional materials for the course on the web. Yes, I recommend this book as another possible textbook in an introductory Microeconomics.